This article originally appeared on Credit Card Compare and is republished here with permission. For centuries, countries around the world have united their people under the ultimate symbol of nationality — a flag. Whether riding into battle after it or waving it at a sporting event, a national flag is a universal way of associating yourself with others from the same place. For the leaders of the country, a flag can be an important tool for inspiring patriotism. Historically, national flags were mostly used on the battlefield (as military standards) and on ships, where they were introduced to show the country of origin of trading vessels from the early 17th century onwards. In countries like the United States and France, flags began to take on even more importance in the 18th century as symbols of revolution and new identity. Because national flags have such a symbolic political purpose, many of the designs we know today have changed dramatically over the years. The colors and symbols on a national flag must be carefully chosen, making sure that they capture the essence of that nation. As the sense of identity shifts, so, too, does the design. You can learn a lot about a country’s history by looking at the changes that were made – and this is especially true with countries that gained their independence relatively recently. Here, we’ve compiled ten national flags and traced their evolution throughout history. As a former British colony, Australia flew the Union Jack until the 20th century. At this point, it was decided that the country needed its own national flag, and a version of the blue ensign was adopted instead. To give it a real Australian flavor, six stars were added in the shape of the Southern Cross constellation – a symbol of Australia since the early days of British rule -– with one large seven-pointed Federation Star to represent the country’s territories. Until as recently as the mid-1960s, Canada didn’t have an official national flag. For most of its history, it flew variations on the red ensign, featuring the Union Jack even after Canadian independence in 1931. Complete with its iconic maple leaf, the flag is a well-established symbol of Canada as a country -– a testament to how well designed it is, given that it’s less than 60 years old. 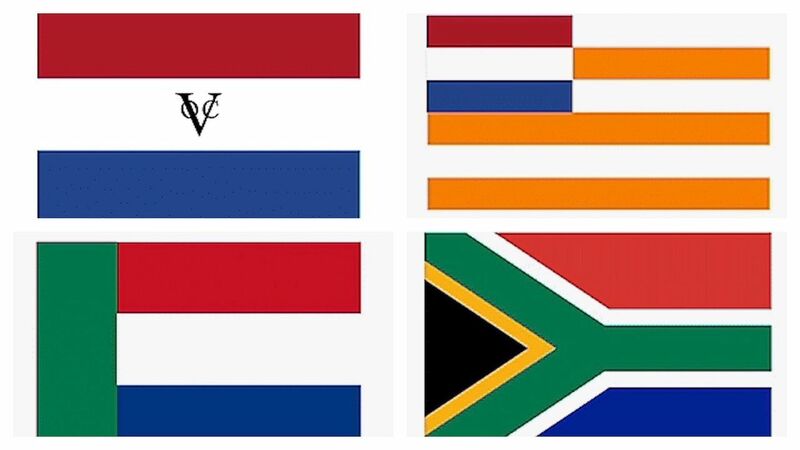 One of the newest national flags, South Africa’s is a hugely symbolic one, introduced in 1994 to represent the country’s move away from apartheid. The flag was designed and produced in a rush, initially intended to be only an interim design – but it proved to be so popular that it was kept permanently. While the current flag takes inspiration from several of the past designs, it still manages to be unique, helping a nation move on to a better future for its people. While it’s a long way from the flag of the Qing dynasty, China’s national flag is a simple but effective representation of a country. It has just fives stars – one large one and four smaller ones – on a plain red background. The red background represents the revolution, while the large star represents the Communist Party and the smaller stars the people of China, unified under its leadership. In this way, the flag acts as the ultimate symbol of the ethos that holds such a large country together. Not many national flags inspire as much devotion as that of the United States – demonstrated in part by the number of nicknames it has (Stars and Stripes, Old Glory and the Star-Spangled Banner) and the way it’s flown with pride on everything from the houses of everyday Americans to, of course, the Moon. Its design has gone through some intriguing changes over the years, with new stars being added to the spangled banner after the admission of each new state. Some flag design changes seem to come out of the blue, and that was very much the case with the 20th-century adaptation of the Portuguese flag, ushered in by the downfall of the monarchy and rise of the republic. The red and green colors of the Republican Party were adopted onto the national flag in 1911. They represent hope and the red blood of those who died to earn it, replacing the white backgrounds of previous flags. It’s not surprising that a country with as rich a history as Egypt has plenty of symbolism behind its national flag design. Its colors date back to the 1952 revolution, with red representing the time before the uprising against the monarchy and the British. The white represents that it was a bloodless revolution, while the black is there to symbolize the end of the oppression of the Egyptian people. In the center sits the Eagle of Saladin, an emblem of Arab nationalism, which was added in 1984. The design of Colombia’s current national flag dates back to its day as part of Gran Colombia, along with Venezuela and Ecuador, both of whom have similar flags. The colors are said to signify the riches of the country (yellow); the seas, rivers and sky (blue); and the blood spilled to achieve Colombian independence (red). Notably, unlike most other tricolor flags, the yellow has a ratio of 2:1:1, a feature of the old flag that both Colombia and Ecuador kept. The current Mongolian national flag has its roots in several of its predecessors, most notably the Soyombo symbol on the left-hand side, which is the national symbol of the country. It represents fire, sun, moon, earth, and water. For much of the 20th century, it also had a socialist star on top -– until Mongolia rejected socialism in 1992. The colors of the flag are also symbolic, with the central blue stripe representing the eternal blue sky, surrounded by red stripes that represent fire and prosperity. The three main colors of the Hungarian flag were first used in the 13th century. While its design has gone through a lot of changes since then, many of them have been along the lines of the current tricolor design. The colors represent strength (red), fidelity (white) and hope (green). The national flag has remained unchanged since 1957; its straightforward design meant that it didn’t require any alteration after the fall of the communist regime in 1989. More like this: Can you guess the country’s flag? The post These awesome GIFs show how 10 nation’s flags have changed throughout history appeared first on Matador Network. August 6, 2018 at 11:21 AM Is it time to remove Zuckerberg from (his) office?